Lipofreeze is an outpatient procedure that requires no cutting, numbing or restrictions on patients movement or abilities. With Lipofreeze fat cells are cooled so that they are rendered non-functional. Thus meaning fat cells are destroyed and over the course of the next few weeks fat cells are naturally eliminated from the body. Each desired spot is only treated for about 60 minutes per area. Lipofreeze fat reduction is not meant for extreme obesity or all over weight loss. However, it is perfect for body contouring those stubborn areas like arm fat and love handles. Each treatment yields approximately a 20 percent fat reduction. This is the only FDA cleared non-surgical fat reduction treatment that uses controlled cooling to eliminate stubborn fat that resists all efforts through diet and exercise. The results are proven, noticeable and lasting! 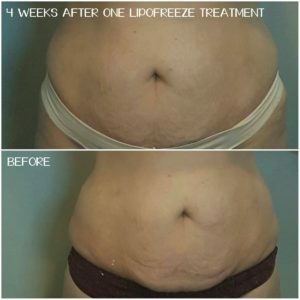 When will I see the full results of Lipofreeze? Most patients see results in 2-3 weeks. However, you won’t see the full results until closer to 2-4 months. Most patients only need 1-3 treatments per area. We also recommend that the treatments be done 4-6 weeks apart.